I discovered Winston Rodney’s voice on a compilation cassette called Grooveyard, which included the killer Black Disciples track “Marcus Garvey” alongside classic tracks by Lee Perry, The Melodians, Max Romeo, Toots and the Maytals, Jimmy Cliff, the Heptones, Junior Murvin, and others, including if I’m not mistaken, Nigerian superstar King Sunny Ade! As amazing as all these recordings are, “Marcus Garvey” stood out. I didn’t really know why at the time but something about the vocal performance captivated me. And so began the quest. The next phase of discovery included some of his newest, (at the time), and oldest recordings. 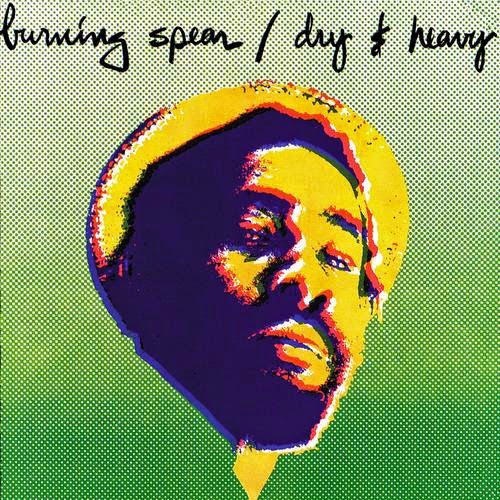 In a local record shop I found and purchased an old 45 of “Door Peep”, the double LP “Spear Burning” from the mid 70’s as well as 1990’s “Mek We Dweet”. Quite a range of music represented right there, and I would have probably bought every Spear recording I could find, had I not been stretching hard to pay the $216/month for my rent... now THOSE were the days! It wasn’t until several years later that I discovered the incredible release known as “Dry and Heavy”, and it remains at the top of my desert island list today. From the opening signature Horsemouth Wallace drum lead-in to “Any River” all the way through to the final strains of Mr. Rodney’s voice chanting Freedom at the end of side two... the many layers of guitars, organ, clav, nyabhingi percussion, and horns, all played in what we lovingly refer to as the elusive “cultural tuning”, never gets overly dense. And for connoisseurs of the string machine, there is plenty to love here. Looking back on it now I realize what it was that turned me on so much about “Marcus Garvey” when I first heard it. It’s the restraint. You get the sense that the Spear is keeping cool amidst chaos, mostly holding back the full force of his Voice. There are a few moments on side one where you get brief blasts of power - during the outros of “The Sun” and especially “Throw Down Your Arms” emerge the guttural percolations of a man channeling his slave ancestors suffering and wailing. And toward the end of the title track, finally, the triumph of the Spear-it rings out. Loud and Clear. That dynamic plays out in his live set as well. The restraint and the triumph. In the late 90’s, traveling parallel to the Burning Band and sharing stages all around the US with Mr. Rodney I watched him daily saving up his energy for the stage. He knew us American kids were inspired by his music and that we wanted his blessing on our own take on Reggae. He obliged in his dignified way. I will always remember the sight of Mr. Rodney and his shining gold teeth looking on from the side of the stage while we finished our set. Yet he never spoke more than a few words at a time to me. His band and crew, most of them younger and a mix of Jamaican and American were less intimidating and I got to know a few of them pretty well, and learned that indeed Mr. Rodney was impressed by what he heard but was not in the habit of showering praises on anyone... and I always wondered if it was somewhat strange, and possibly unsettling for him to see a mostly white, American band on the road making their living playing what was essentially his people’s music. In any case my reverence for his music lives on and I personally salute the man for his fierce independence and continuously outspoken stance on the music industry. The man’s convictions are as strong now as ever and he still speaks truth to power with an authority and dignity that come from a lifetime of chanting down the wicked. 10 Deadly Shots Vol. III Pre-order!